Your son’s first haircut is a pretty big deal for most fathers. Many dads prefer their sons to go to the same place where they get their own hair cut, and at Dave’s Barber, we completely understand the importance of the father-son bonding experience. For kids’ cuts, it’s best to stay as low-maintenance as possible. Kids, especially your littlest guys, are often very active and do not necessarily want to maintain their hair. If low maintenance is your goal, we can create a short style that never looks bad, even on bedhead hair. Truth be told, that depends on how much hair your son has. If he has thick locks of curls already before his first birthday, it might be a good idea to go ahead and bring him in for a trim. If he’s a late bloomer on the hair-growing front, that’s ok, too. There really isn’t a magic age that’s ideal for a first haircut. As a Dad, you’ve probably learned the the subtle art of distraction. A great way to keep your little guy calm during his first haircut is by bringing a favorite toy or book for him to look at. As a first-timer, being in a new place can make kids apprehensive, so arriving a few minutes early might be a good idea. 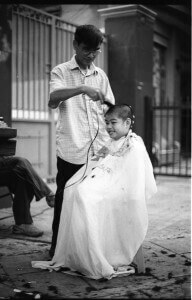 Show him the barber’s tools and explain to him that this is where Dads and big boys get their hair cut. If your son has an older sibling, bring them along and have them hop up in the barber’s chair first so he can watch. At Dave’s Barber, we understand that your son’s first haircut is a major milestone. Your little guy transforms from a baby into a little boy, and what Dad doesn’t want to share a barber with his son? Come on by to Dave’s Barber in Woodstock, GA to experience one of your first father-son bonding experiences. We promise you, you won’t be disappointed.